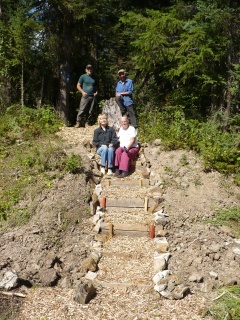 Volunteers from the community of Aleza Lake pose on the completed steps to the South Knolls Trailhead. Last Friday, a group of volunteers from the community of Aleza Lake built steps to the entrance of the South Knolls Trail, and prepared a great lunch for the group after our work was done. Many thanks to Lloyd, Jerry, Ann and Alva for donating their time, ideas and building materials to the project! The wood chips, used for surfacing, were provided by a brushing crew from the PG Youth Custody Services Forestry Program working along the Upper Fraser Road near Giscome. ALRF is holding several trail work bees in August and September, every second Friday. If you are interested in helping out, please contact us! This clump of marsh plume thistle was found at the Research Forest along the South Knolls Trail. It has appeared within the last 12 months and currently measures more than 180cm tall. Marsh plume thistle (Cirsium palustre), listed as a noxious weed in BC’s Central Interior by the Invasive Plant Council of BC, is showing it’s presence in ALRF’s harvest areas. The plant grows in moist locations and competes with native plants and crop trees. A containment program for this purple-flowered plant is currently underway in the Central Interior aimed at preventing its expansion. 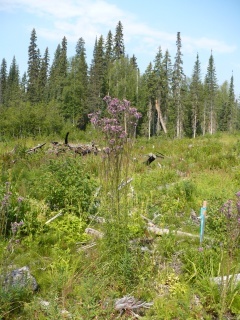 According to the IPCBC the most effective way to limit the spread of the species is by cutting the plants down before they go to seed. Other methods such as biological controls and herbicides are in development. Last summer, several harvest areas on the Research Forest were surveyed for invasive plants and several species were found in varying quantities. This provides excellent baseline information to help ALRF monitor increases and decreases in the diversity and abundance of invasive plants and to implement strategies for managing them.